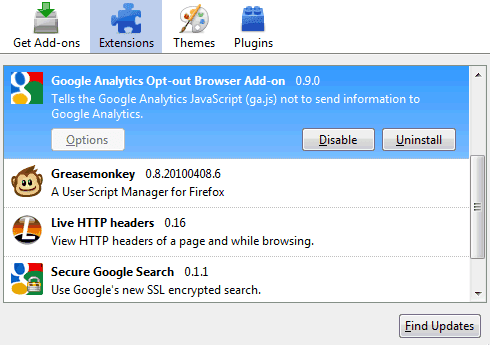 Google released plug-ins for Internet Explorer 7+, Firefox 3.5+ and Chrome 4+ that disable Google Analytics tracking. Google Analytics is by far the most popular free service for getting statistics about the visitors of a site and it's used by a lot of sites, including this blog. Even if the service doesn't show personal information about the visitors and it only provides aggregated data, some people are concerned that Google can track the sites they visit using a seemingly innocuous Google Analytics script. Google explains that Google Analytics uses first-party cookies to track visitor interactions, so the data can't be aggregated for all the domains. "The Google Analytics Terms of Service, which all analytics customers must adhere to, prohibits the tracking or collection of [personal] information using Google Analytics or associating personal information with web analytics information." Those that are concerned about their privacy can install an add-on and permanently disable the script. After installing the add-on, you'll notice that the browser still sends a request for this file: http://www.google-analytics.com/ga.js when visiting a page that uses Google Analytics, but it no longer sends information to Google Analytics. If a lot of users install the add-on, website owners will no longer have accurate stats, they'll no longer be able to find if their content is popular and what sections of their site still need some work. Even if Google didn't release opt-out add-ons, users could still block Google Analytics by adding an entry to the HOSTS file, but the add-ons make it easier to opt-out. Google also added a feature for website owners: Google Analytics can now hide the last octet of the IP address before storing it. "Google Analytics uses the IP address of website visitors to provide general geographic reporting. Website owners can now choose to have Google Analytics store and use only a portion of this IP address for geographic reports. Keep in mind, that using this functionality will somewhat reduce the accuracy of geographic data in your Analytics reports. " I understand having privacy concerns in general, but I can't see why anyone would be bothered about letting a site owner know that someone from [some city], [some state], [some country] visited 3 pages on their site. That seems pretty innocuous/anonymous. I've been blocking analytics from /etc/hosts (mostly due to the cross-site monitoring concern, which is a technical possibility on Google's end). This add-on is a nice gesture. >> This post has been removed by the author. One more reason to drop Google’s services. The reason you have to be worried about innocuous data is that, once added up, it can identify you. Look to the research that showed your user-agent could be used to identify you almost uniquely, just from the crud you'd gotinstalled on your browser. The combination of all the addons/themes/plugins is quite likely to be unique to just you. So, people think the same can apply to data once you've figured out a fancy data-mining search. Installing it looks to be an all-or-nothing ordeal. Are there any solutions for web developers who don't want our own visits to our own websites to count in GA, without blocking other sites? Right now I'm doing this with a cookie triggered by visiting a custom URL, which works but isn't optimal. Go to the Google Analytics settings, click on "Edit" next to a profile and add a filter for your IP address. Another idea: download the Chrome/Firefox extension, edit the code and make sure that the script only runs for your domains. You could also convert the code to a Greasemonkey script. Thanks, Alex. Not sure how I missed that all this time! @Chris : Alternatively, you can install Adblock Plus add-on for Firefox - and disable the analytics (and ALL tracking service) with enabling it on your own domain. Adblock Plus provides an easy way to enable / disable page contents selectively. The idea that “website owners will no longer have accurate stats” is a joke. If it's your site then you should know exactly how many times and to whom you have sent copies of pages. That's what log files are for! The only thing site owners wouldn't be able to do (easily) is correlate the web activity they see with third-party data. Web site owners are outsourcing their monitoring to Google, but that's not the only way to get stats. What about using the Ghostery extension for Firefox to accomplish this? Why block harmless stuff? Some users are so obsessed with blocking/disabling anything on a site that is not article content, and screwing the site owners in general. I'm a site owner, but am glad to see this. I'm not trying to collect anything beyond general usage stats on my site. I want people to feel assured that I'm not trafficking in their data. This is a good idea. I have to PAY for my bandwidth, and Google do not sponsor their CHUNK of that every month. BUT - how do we KNOW that this isn't even WORSE spyware: stops analytics and starts _______. I would like to see Google also develop a filter for the site owner that allows us to block visits by those blocking GA tracking. What's fair is fair. I think you guys are paranoid. Google analytics isn't even in the same ballpark with the risk factors when compared to all the other hacks, leaks and other ways people *really* take advantage of your data. This plugin is just someone messing around with the big boys (Google, MS, Apple, etc.). Cute, and probably viral, but silly nonetheless. Ten bucks says Google will find a way around it anyhow -- if they haven't already. Google made that opt out. Ooh Google, you are so dreamy. You provide a great tracking service and then provide a way for people to opt out if they want. It's nice to see that there is a large search company who cares about what users want. IMO its not a good move. It means Google Analytics will not show us actual data???? GA has NEVER shown precise data. Conpare it to your web server's logs. 20%-25% difference. Best is to block GA via hosts file or to NS requests. The add-on is silly because it doesn't block the script it -> so still tracking. Can't believe that companies use GA for tracking... lmao. So MINT or another web server log software is too expensive? SICK. Refreshing to see aware people. Someone made a good point, they DONT BLOCK THE IP for themselves, they still capture your IP address and screw the website owner. So owner is SERVING Google by having GA on board. Google has the wool pulled over everyone's eyes. Best way to block google, doubleclick and all the other little spyware companies (yes, google is SPYWARE company, plain and simple) is to do so at the DNS level. This means setting up a custom hosts file. I just installed Google chrome and browsing for it's available add-ons. But here I came to know about something new that how we are being tracked by Google. Thanks for the information.